This is a great recipe to use up all those low carb veggies in the fridge -, zucchini, spinach, onions, peppers, kale, chard, cauliflower. 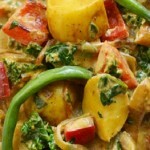 This is also a perfect meal if you want to eat vegan, dairy free or wheat or gluten free! In a large skillet set over medium-high heat, sauté the onions in a drizzle of oil for 2-3 minutes, until soft. Add any firm veggie you’re using, such as cauliflower, and cook them for a few minutes, until they soften and start to turn golden on the edges. 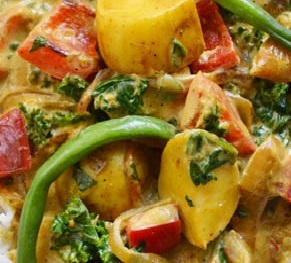 Add the remaining vegetables along with the curry paste, cumin, salt and coconut cream and bring the mixture to a simmer. Stir in the spinach and cook for a minute, just until it wilts.